Well, my friends, today is the last tutorial in this series—it has been a joy to teach them to you! 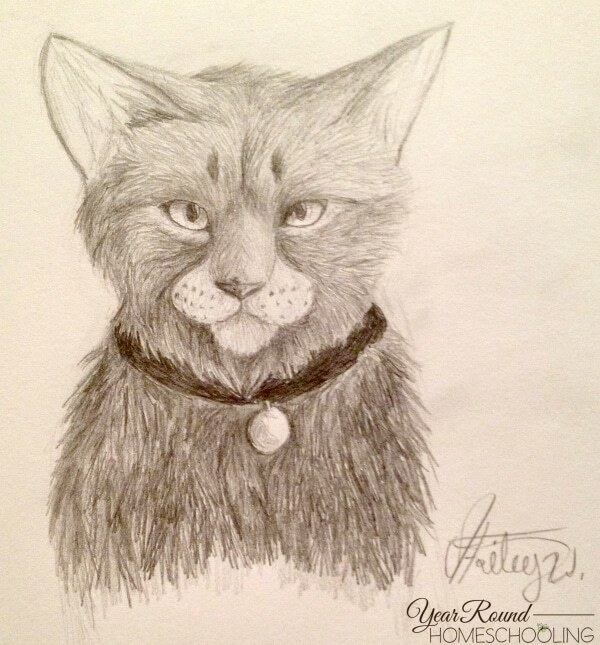 Since we started off with a cat, I thought: “Why not end with a cat as well?” Last time, we drew a battle-scarred cat using digital media, but today we’re going to learn how to draw a cat with graphite pencils! To start off, we only need to draw some simple shapes—that’s easy right?! Yet, it is an integral step in your drawing process, as these shapes will be the base of your picture. On the middle of your paper, start off by lightly sketching a circle. Then sketch in two very narrow triangles on either side of the top of your circle—and from there, draw two slightly larger triangles right against your narrow ones. Lastly, sketch a curved line on either side of the circle, as shown below. Once you’ve drawn these simple shapes, you’ve completed step one! For your next step, add two almond shaped eyes—be sure to have at least one eye-width of space between your cat’s eyes, so everything looks well proportioned. Now, from each inner corner of your almond shapes, extend a line down about one eye-length. Then connect those lines with an upside down triangle, which will be your cat’s nose. 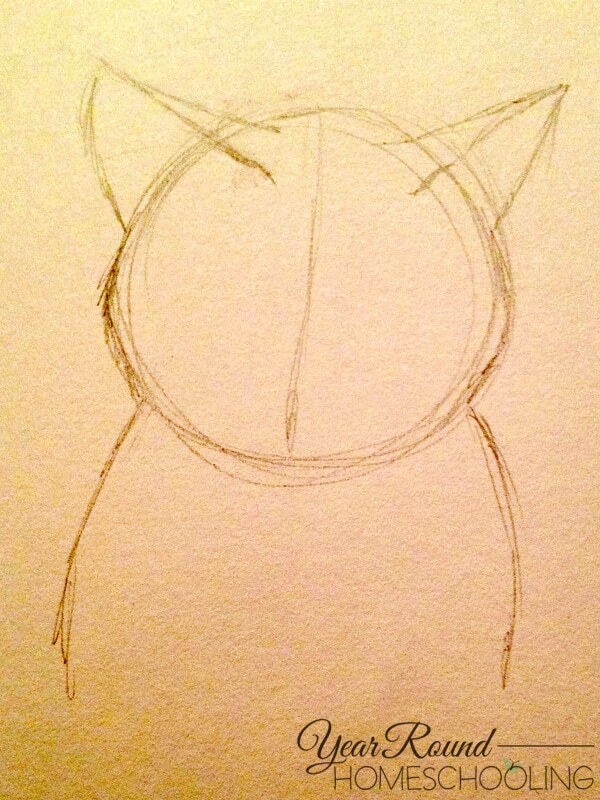 Next, draw two half-circles on either side of your cat’s nose, and a U-shape that will be the chin. 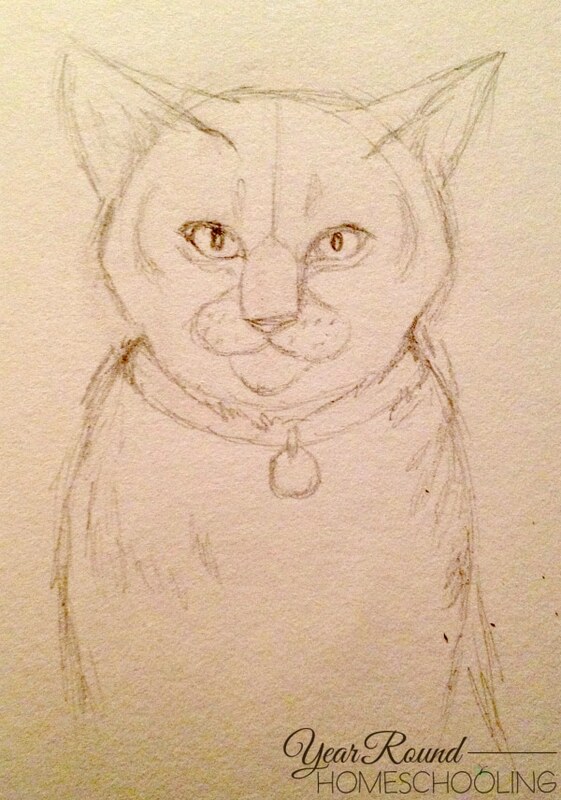 If you’d like at this point you can draw a light collar around the cat’s neck. 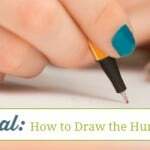 Start defining your lines by going over them again with your pencil. You can draw a circle for the name tag of your collar, if you chose to add one. Shade in some pupils inside the almond shapes you drew, and darken the top line of the cat’s eyes. Begin finding areas to place small bits of shading, so that when you come back and add the fur, you have an idea of which direction the fur is flowing. Now you can begin laying in the fur. Pay attention to which direction the fur is flowing. For example, starting at the top of the left eye, the fur flows in the direction of the cat’s cheek. It curves over the top of the eye, and on the bottom of the eye, it goes outward. For the fur underneath the collar, use a moderate amount of pressure on your pencil to darken the area. Be mindful of the areas on the cat’s fur that use darker shades, and pay attention to where your light source is coming from. 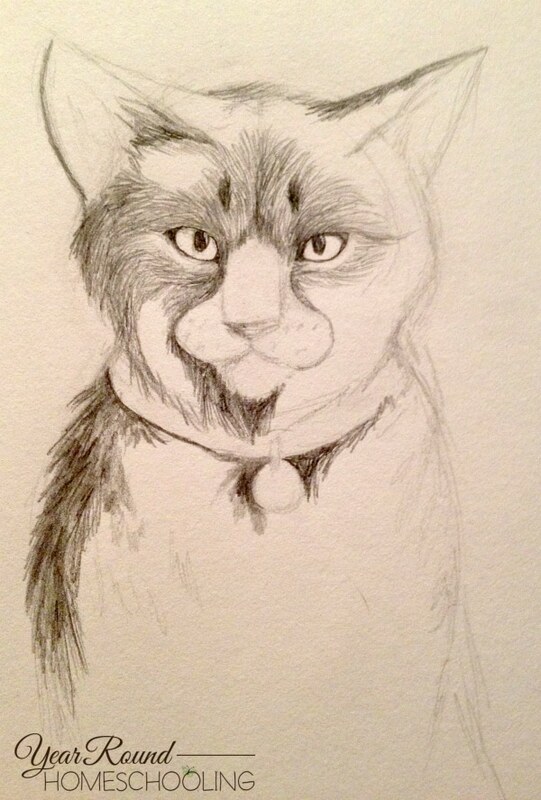 Continue adding your fur strokes to the cat’s face, and begin shading the chest area with thick pencil strokes (fur on the face is smaller and finer than fur everywhere else. Leave the area where the collar should be blank for now. For the cat’s muzzle, lightly sketch tiny hairs—your pencil marks should hardly be visible, while still adding darker values. With fast, long strokes, add the soft inner ear fur—and then use small strokes for the fur on the backs of the cat’s ears. 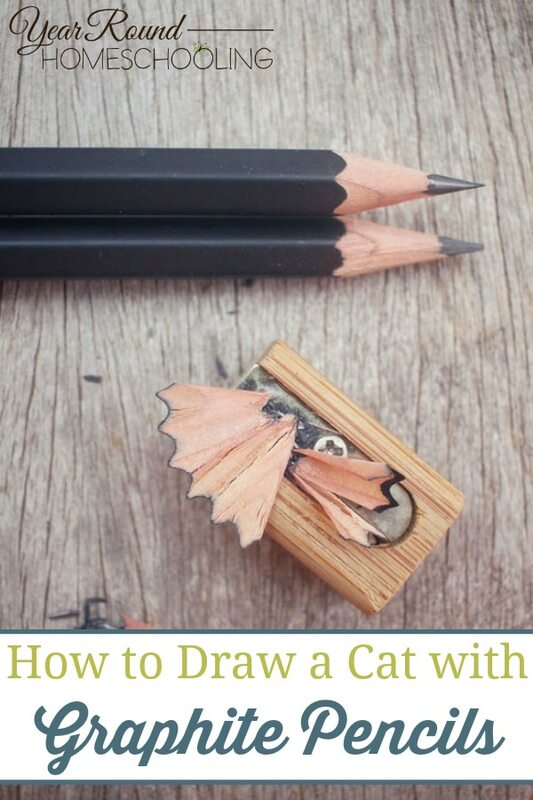 You’re almost done learning how to draw a cat with graphite pencils! 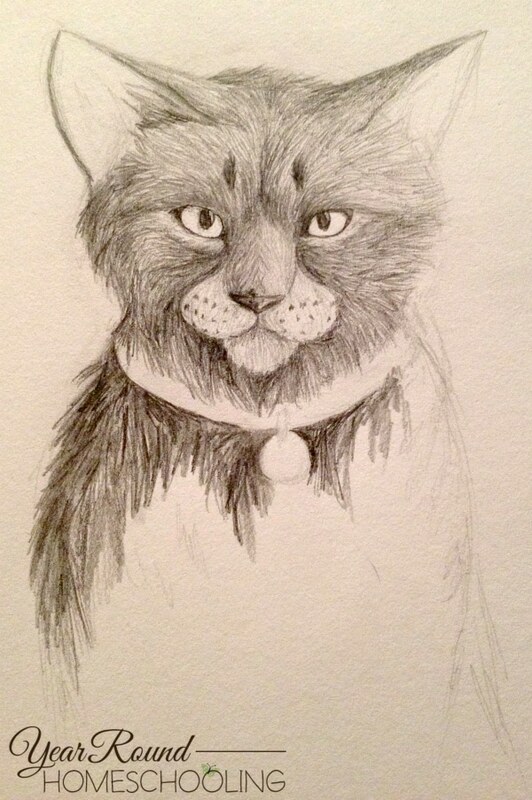 Your final steps are to finish filling any blank spaces with fur and shading. Go over the places you’ve already drawn, darkening areas as needed. 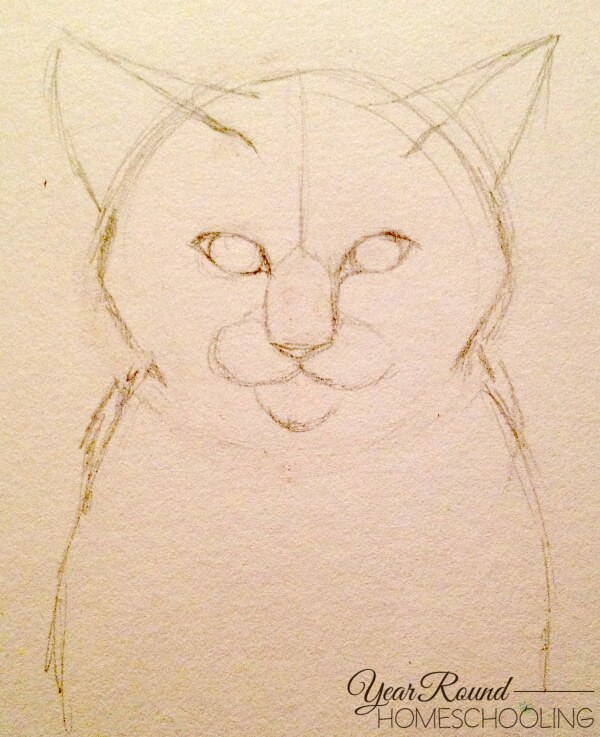 Color in the cat’s collar with your darkest pencil—and be sure to apply more pressure to darken an area. Add light shading to the tag on the cat’s collar, being sure to leave one space completely white to give it a metallic look. And finally, shade the cat’s eyes lightly—the darkest areas near the tops of the eyes, and fading down to white at the bottom. Well done! 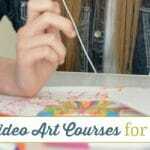 It has been a fun adventure teaching drawing lessons here and I hope you learned some tips from this series! If drawing is your passion keep practicing—for if you practice, you can achieve anything! 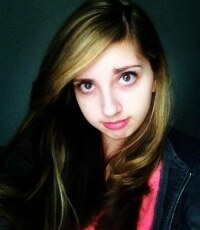 Hailey Woerner is a young author following her dreams. She is one of those…introverted types, if you will. She finds her passion in writing, drawing, singing, and serving on her high school worship team. Some have called her creative, intuitive, quiet, gentle, and graceful, though sometimes hot-headed. She lives in the wonderful state of VA with her family of seven, and loves watching the seasons change over the mountains. You can often find her sitting alone, thinking up new ways to tell an old tale, or creating tunes for a new song she has written, but she always welcomes conversation to those who come up to her! Just watch yourself, or she might find some way to work you into her next novel. You can follow her on her blog, Facebook and on Deviant Art. 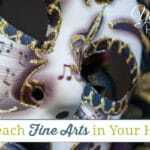 Thanks for sharing your wonderful post at Inspire Me Monday at Create With Joy! Congratulations – you are one of our Featured Guests at this week’s party – #262!